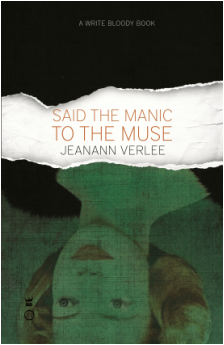 Jeanann Verlee’s second collection, Said the Manic to the Muse (Write Bloody, 2015), is a blunt, resilient exploration of loss, grief, and the battle to attain wholeness while claiming the complex parts of who we are. It is a book that gives voice to manic depression, heartbreak, survival and shame, exploring the severe and harrowing experience of being in one’s body when it becomes unbearable to feel. The speaker endures both trauma and the brutal monotony of daily life while allowing herself to risk and feel. At its core, Said the Manic to the Muse is a book of love poems for women, real and mythical, who: “shimmied hard as a wrecking ball,” “curse a cop in a riot,” “wouldn’t go out frayed and bleating,” and who teach us how to cope and survive. I’m sorry I scratched your Neil Diamond record. Drew the picture of the dead cat. Titled it after my dead sister. I’m sorry they pulled her from your body like a sad, wet sponge. I’m sorry no one came to the hospital. Sorry I felt sorry. hard in her bones hardened. The events in this poem mirror the speaker’s own life, surfacing throughout the collection in narratives about the devastation of repeated miscarriages and the ending of a relationship. The mother is almost a doppelganger, a shadow-self that illuminates and haunts the speaker as she makes sense of her life. or ruthless to the fools), so this was a day of allowances. I love that this poem dismantles the word “frivolous.” That reading it, I saw myself tentatively walking into a nice store, fighting against shame and unworthiness. It gives us permission to indulge in what delights us, understanding that it takes bravery to feel good in one’s body, to celebrate and be seen. The poem also smashed any critique I had felt about the Oprah article, or at least cast it in a new light. her yelp beneath their boots, the snarl she gave. The stubborn growl. The refusal. It is how she tried. You, naked and beaten. And she, the fighter.